From any cities of country Nepal you can reach in Nepalgunj from where you can head towards Shey Phoksundo locally Dolpo Shey Phoksumdo in the largest district Dolpa of Nepal. 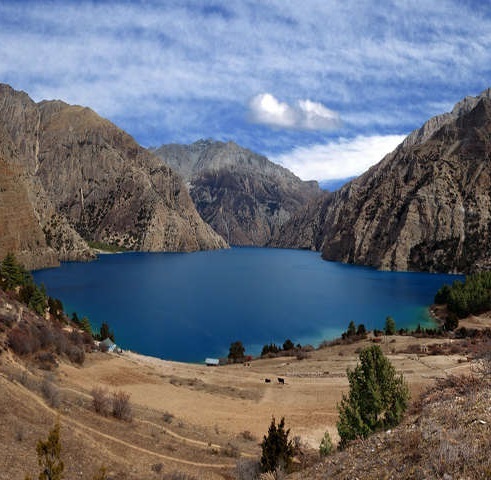 This lake located within Shey Phoksundo National Park. It is the deepest lake of Nepal. The environment around pretty nice that catches by its beauty. The surrounding is so natural that there is no sign of human influence. Here I like to explain about the route to Shey Phoksundo Lake. Probably it would be better starting route from Nepalgunj. Anyone can get to Nepalgunj easily from major cities of Nepal. Your first day would be reaching Nepalgunj and staying. For the travelers who prefer hiking, and use jeep as transportation means they would reached out following given route. The timing and condition would not be same however it would helpful to make some sorts of outline that depends on traveling members and their preferences, experience & capabilities for travelling. (In Jeep- Nepalgunj to Khalanga, In bus- Khalanga to Rinma) When you take jeep for Khalanga of Jajarkot district from Nepalgunj in the morning you can take breakfast in Chinchu Bajar. Chinchu Bajar is point where route separated for Surkhet, Jumla and Khalanga (Jagarkot). Jeep headed toward Khalanga, in pitch road along the bank of Bheri river, having meal in the way with the taste of local fish of Bheri river, from where after about 5 hours of Jeep travel you need to take (next) bus (that wouldn't move unless fill up with passengers) to Rinma Village in muddy/earthy road. Rinma is small market from where you can take your essentials for trekking ahead, incase it's expensive in route ahead. In Jeep in three different phases. In every point of stops you have to wait hours to make sure jeep is fully packed. It takes whole days almost to reach Tribeni in this way. The roads are newly constructed, rocky that may cause flat tyres any time, scary cliffs with roofed full passengers with hanging sidewise as well. There is a beautiful waterfall in between the way that makes you forget your fear for a while at least. At the end of adventurous jeep riding you would reached tribeni which is close to Bheri river. Sounds of Bheri river flowing amuse much during night. (Tribeni - Khadang - Siureni - Tripurakot) You have to walk from this day ahead. Actural fond of travelling from this point. Tribeni lies in Rukum District while Tripurakot in Dolpa district. Road track has been opened upto Khadang of Dolpa so, Dolpa is no more remain untouched by road network. But for recent time we just need to walk along the ways with mules back and forth. You can have your meal in Khadang. Then you need to move ahead. There is a traditional water mill in the way. The way is not good as it is the rocky in recently made track. One should think twice while moving ahead. The movement of air along Bheri river is strong that would made plesant while making ahead. There is a village called Siureni 1 and half hour closer than Tripurakot. You can stay Siureni if you couldn't made to Tripurakot. (Tripurakot - Suligad - Kageni) You can take Jeep to Dunai from across Tripurakot river. Dunai is the headquater of Dolpa district. After 1 hours of Jeep travel you can reached to Suligad. Then you begin to trek to Kageni from there. The climate on the way may be pretty cold depends on season of your travel be sure of it. (Kageni - Chhepka - Phaparbari - Reichi) The way you begin from kageni is like you are travelling somewhere in heaven found different pleasure environment. Landscapes would turns dry to greenary. Colourful trees of the forest decorate the landscape. Snow is above hills may occur if it is raining. It would take a bit more to reache Chhepka to have a lunch there if you are moving in slow pace. October would be the nice season to visit the place. If you think you can't head ahead and you are getting late you can stay in Pharparbari which is about 1 hour close than Reichi village. In almost every place you stay you have chance to have tibetain tea. With the taste of tasty tibetean tea you can move ahead. It would be more amazing to get close to Shey Phoksundo, every moment get pleasure. Having lunch in hotel somewhere in downhill, it would take 3 more hours to reach the peak where Jharna View Point is located. This way is steep to reach in the peak. Jharna, the waterfall is made by the water flowing from Shey Phoksundo. It is the most attractive waterfall in Nepal. It help to forget all tiredness climbing all way up. You can spent sometime there enjoying taking photograph and lost in natural beauty. Reaching Phoksundo there is a hotel Kanchanjunga near Phoksundo lake. In the morining next day you can enjoy the scenario of Phoksundo lake. The blue clear water, beautiful scenario around and open sky that gives you unlimited feeling of joy. Then to view the lake from the hill top above it you can headed towards the view point. It's again a steep hill but this time you wouldn't know how easily you reached to the top of an altitude about 3890m from the sea level in the view point. The three faces of Shey Phoksundo would clearly seen from the view point. You would not want to leave the place the deep blue clear water, open sky, surrounded by mountains would makes you feel like to stay for long. But, it would be time to leave without any minute felt unattracted by the lake. While returning it would not be a problem compare to uphill following the same trail if you like to return quickly by plane upto Nepalgunj you need to reach Juphal Airport. You need to move to Kageni, then to Suligad and finally to Juphal. It would approximately takes a day. You may/mayn't get the ticket for same day. If you don't get ticket for the same date you have to wait a day or days as sometimes locals have to wait for days to get a ticket. Shey Phoksundo is the hidden treasure of Nepal. Once we need to visit the lake in one time human life. It is better to know different place and people. You would have new kind of experience visiting to Phoksundo. The Phoksundo is awating to you, make your limb directed towards it. This is a small effort I made to you to be there some time in your life time.